It had been a very long summer in several places in Indonesia and this long hot summer has caused draught, forest fire and even lack of clean water and no electricity. Up until today, the forest fire has become a huge problems in the island of Borneo or known also as Kalimantan. This is a picture from NASA and situation in Borneo (Kalimantan Island) of Indonesia. Please PRAY for this situation, the smoke level is critical and caused lots of health problems to the people. We have friends and colleagues who live and work in Central Borneo where most effected area. They keep asking for lots of people to pray for them and asking God to send rain to put out the fire and clear off the atmosphere. Would you join them and us in prayers? Heavy smoke continued to pour from peat fires in Borneo, Indonesia, when the Moderate Resolution Imaging Spectroradiometer (MODIS) on NASA’s Aqua satellite captured this image on October 19, 2015. Red outlines indicate hot spots where the sensor detected unusually warm surface temperatures associated with fires. Gray smoke hovers over the island and has triggered air quality alerts and health warnings in Indonesia and neighboring countries. Small cumulus clouds are visible along Borneo’s southern coast. The lower image shows a more detailed view of some of the fires. Read more about the fires here. Thank You so much for stopping by today and taking a moment to pray for Indonesia! I am thankful for every time I can have time to sit, read His word, meditate on His teaching, pray to Him and be changed by His power. I am thankful for Grace Baptist Church family, friends at our Church Bible study & Prayer group, HelloMornings sisters in my FB online study group, Bible Journaling Community (on Facebook and Instagram), sermon podcasts, and even online worship channels. I am thankful for all the access I have to His words in languages I can understand best. As thanking God for these great blessings, I never stop praying for those people in SEA* to have access to God’s living word that powerful enough to change their lives, that the Word of God will available to them in 700+ languages they speak and they understand best. Praying for open doors to the closed doors. Praying for those who are there among them who translating the Word into their languages. Praying for more workers to go (including us) and work side by side with the nationals to answer God’s calling and to obey the Great Commandment. Would you join me and my family in prayer for these requests to see God reveal Himself and glory to the people? Would you be partner prayerfully and financially with Wycliffe Associates through the works that we’ll be doing in the country to bring the Good News to the people in languages they understand best? If you feel God speaks something to you when you pray and feel you wanna share with us, please feel free to send me an email. Please visit this link to partner with us. Thank you so much for joining us in prayers and God bless you! Dayaks are the native people groups in the Kalimantan Island. The Sanggau-Sekadau group lives in the areas of Sanggau and Sekadau, which are separated by only about an hour’s travel by public transportation. Dayaks become Sanggau-Sekadau Muslims either as individuals, in a family, or together with all the people in a larger group. The term “Dayak Senganan” refers to a group of Dayaks who are Muslims, who claim themselves as Sekadau Malay. The Sanggau-Sekadau live mostly around the capital cities of the Sanggau and Sekadau regencies in East Kalimantan. Mystical influences, however, are still evident in their lives. A shaman is an important figure in their society, but they are considered poor because of the many prohibitions placed upon them. Some have changed religions for personal reasons while others have married with a Muslim Melayu transmigrant. The specific factors involved in their changing of religion have been obscured by several generations of time. The Sanggau-Sekadau group is part of the Dayak ethnolinguistic grouping called the Land Dayak which also includes the Bakati, Bakati Rara (Serawak, Malaysia), Bakati Sara, Bidayuh (Serawak, Malaysia), Jangkang, Kembayan, Ribun, Semandang and Benyadu. The Trans-Kalimantan road crosses over the Sanggau and Sekadau lands in Eastern Kalimantan regency. The road, however, does not go through Central and Western Kalimantan. The Sanggau-Sekadau live together in small numbers with the Dayak and other transmigrants. The Kapuas and Sekayam are the two main rivers in the area. Rivers serve as the main transportation conduits for people living in most villages, as land transportation is very difficult. Distribution of goods such as food, medicines, agricultural products and more also takes place via the rivers. Water vehicles commonly include sampan (small boats), barges and motor boats. The Sanggau-Sekadau make their living through farming and fishing in the river. Many Sanggau-Sekadau, however, are poor. Pray for strategies and ways to reach out to them. Pray for these people’s hearts. Pray for God’s people to go reach them out and bring the Good News to them. Pray for translators to go translating His word for them so they may come to understanding the true living God and worship Him. It is New Year’s Eve!!! WOW… can you believe that we are on the last day of 2014? I am thankful for 2014. As parents, Dave and I grow in learning to be parents, keep asking God to give us wisdom to teach them the truth and walk in love. We went through tough days but He was there to help us. Direct your children onto the right path, and when they are older, they will not leave it (Proverbs 22:6, NLT). 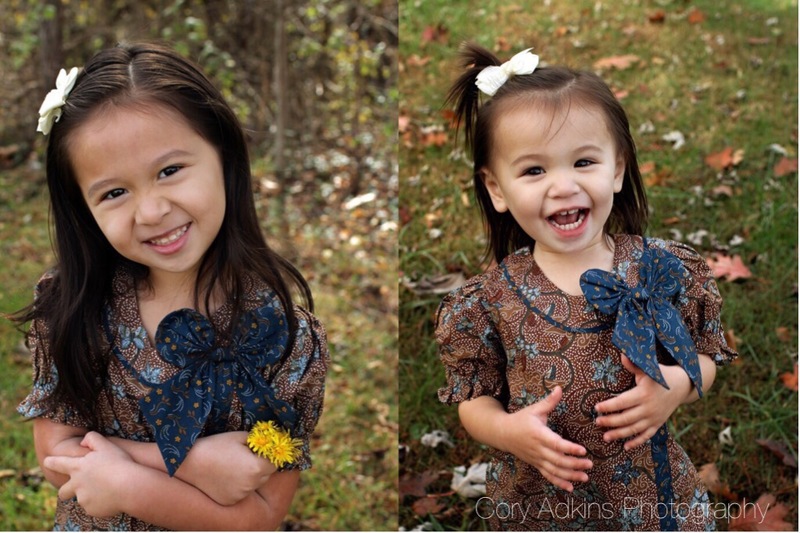 We love love love camping out in the Spring, Summer & Fall! That the best thing we found out our daughters LOVE being out in the nature because both my husband and I love outdoor activities. As husband and wife, we celebrated our 6th Anniversary and this year was our 7th Christmas together. Each day we grow to love each other more and more… I am thankful for my amazing, loving and supporting husband. Dave is an answer to my prayer! There was a bit change in our ministry. In January we resigned from Wycliffe Bible Translators. We were so discouraged and kept seeking God for answers. Dave and I felt in our hearts that God still want us to go to SEA* as missionaries. So, we went to a mission conference focusing on that particular country. There we learned so much important updates, talked to some people and meeting with some friends we knew before from the country. We were looking for an new opportunity to serve. Then couple days after we came back home, we got a call from the area director of Wycliffe Associates (it is a partner organization with WBT) and a director of a mission agency in the country offering both of us opportunities that we never thought of before. These new opportunities are perfectly fit for each of us. We were surprised by God and how He worked again and again! So we started our journey in September and right now we are raising support to go to SEA* serving with Wycliffe Associates as supported volunteers in 2015! We have some works to do remotely from home and cannot wait to work with the mother tongue translators & local churches directly soon to help them bringing the Good News to the 450+ Unreached & Bibleless People Groups! If you would like to know more details, we would love to share with you more 🙂 You can sign up for our ministry newsletter & prayer update HERE. Please pray for us daily in our preparation to go and also please be prayerfully to consider to support us to go here. Your prayers & partnership end the Bible poverty in SEA*, because of your partnership those people can have God’s word in languages they can understand best in their hearts so that they may come to worship the one true living God through Jesus Christ through the works we will be doing there with the team. We are thankful for our families, friends, church, and all new partners God has brought into our lives in 2014. THANK YOU from the bottom of our hearts! This year has been amazing for me personally. I learn a lot. Through personal quite time with the Lord, He help me to keep my eyes on Him and have faith in Him. Also, through group devotional time with our small church prayer meeting group & HelloMornings group, I learned so much of God, His love & truly He listened to our prayers. In August, again, I was able to attend an amazing women blogging conference, Declare Conference, in Texas. I reconnected with blogging & online friends, met new “internet” friends I met in real life & even God led me to new connections with some friends. This was my second conference and He has blessed me tremendously! I am praying and hoping to go next year if we’re still here 🙂 You should check this conference and pray about going! They have limited seats for 2015! 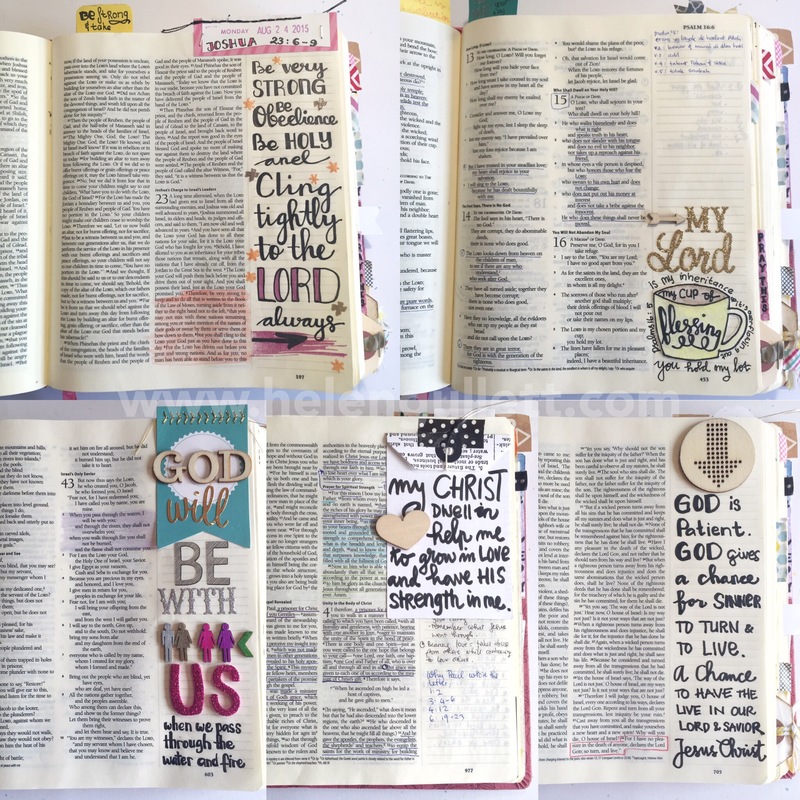 In October, a scrapbooking friend introduced me to a group on Facebook, Journaling Bible Community, where I find lots of inspirations how to illustrate our faith and love for God in creative ways. 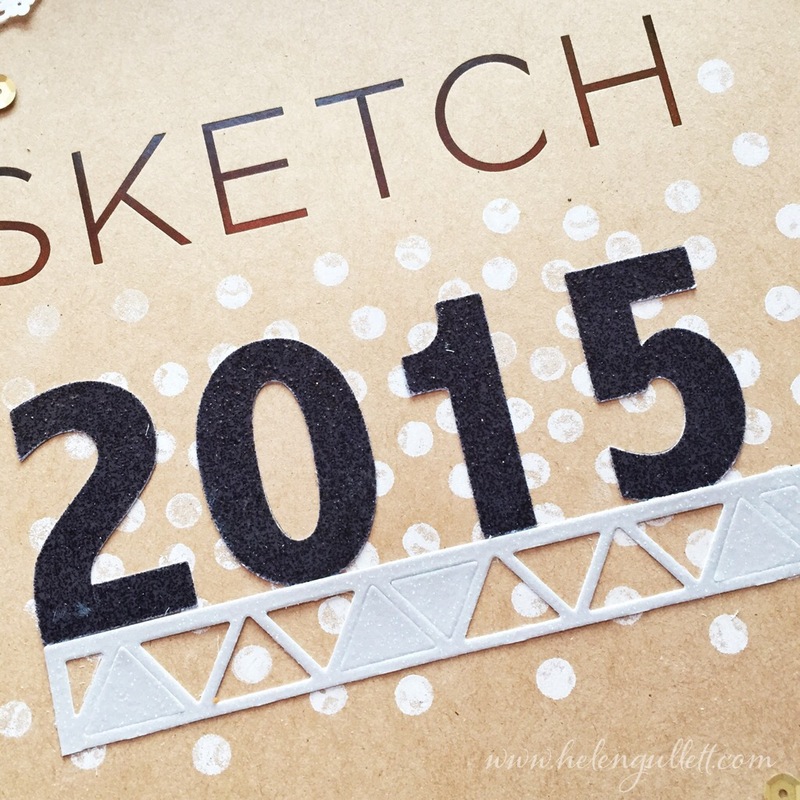 For the big year title, I cut the 2015 with my Silhouette Cameo using DCWV glitter cardstock and the triangle border I cut the glitter cardstock using the Triangles Cutting plate from Taylored Expressions. The white polkadots is very easy to do. I trace the numbers, and then start stamping the dots using the eraser of my daugther’s pencil. I used CTMH White Archival Ink. I heat set it for a quick dry. Then I glued the numbers and triangle border. 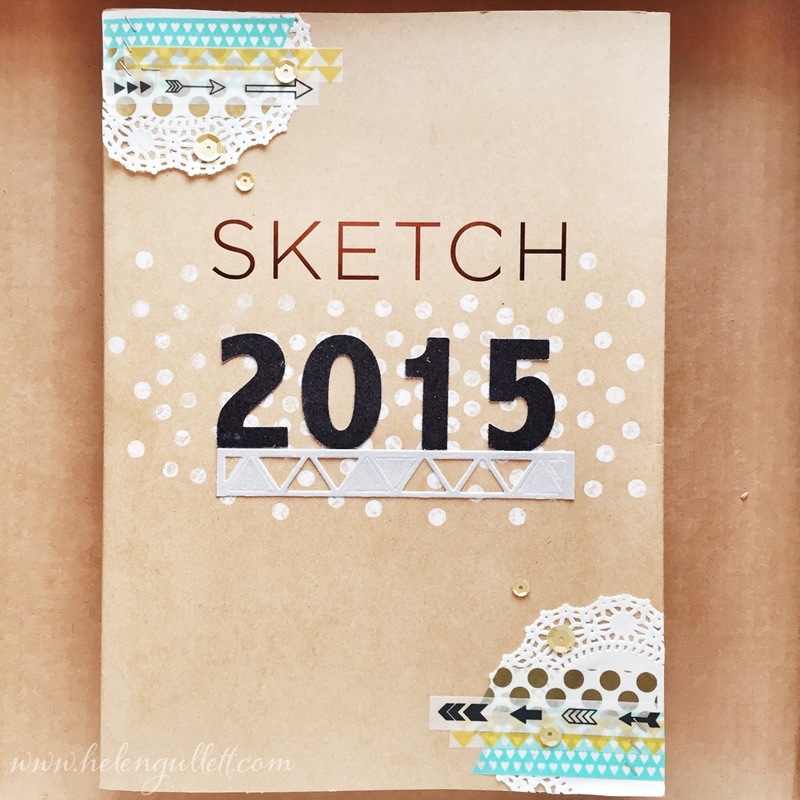 Today I am sharing my project at Stuck On U Sketches Die Cut new challenge, Anything New Year. Check it out here! Hope you can play along with us this week 🙂 Click here to link up your project(s). I wanna take this day to THANK YOU ALL for all your love, prayers & supports in 2014 for me and my family! Thank you for inspiring me! God bless you abundantly in 2015! Would You Pray For Them Today? You may have heard and saw on news about this plane crash, AirAsia QZ8501. The latest news I read from an online news, that they found the crash location, some of the plane’s debris & still searching for bodies in bad weather. So far they have found several bodies according to BBC news. I found out that a friend of mine who is a teacher in one of a school in Surabaya that 3 of her students were aboard that plane to Singapore for a holiday break. And I saw friend’s post on Facebook today that her friend was one of the stewards on duty on that plane. My heart ache and broken for them & their families. I just cannot imagine the sadness and broken-hearted from the families of all of the passengers, and all the crews who were on that plane. 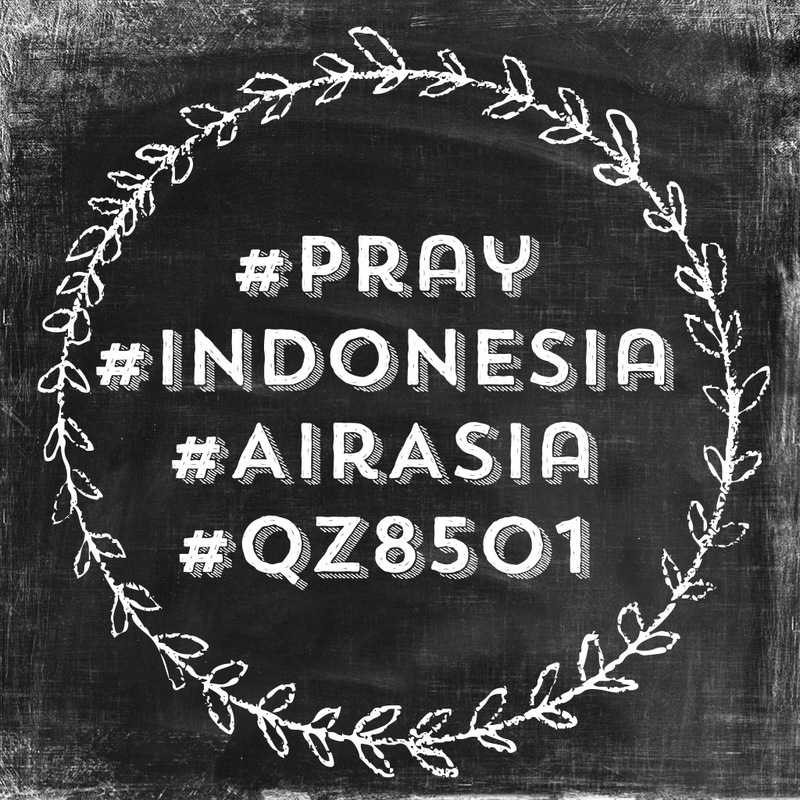 Would your please spend a couple minutes to pray for them, for the families who lost their loved ones and ask God to be with the search teams from Indonesia, neighbor countries & US while they are searching for more in the ocean under this bad weather & limited equipment. Thank you for joining me in prayer for them!